Louisiana Derby 2014; All Eyes on Intense Holiday: Just five weeks away from the 2014 140th running of the Kentucky Derby, the 101st Louisiana Derby will take place at Fair Grounds Race Course on Saturday, March 29, 2014. Intense Holiday, who drew the rail in the post position draw on Wednesday, is scheduled to arrive in Louisiana and will stretch his legs on Thursday and Friday to prepare for the big race as the 2-1 morning line favorite. In addition to Intense Holiday, six three-year-olds who competed in the 2014 Risen Star Stakes return to Fair Grounds for the Louisiana Derby including second place finisher Albano, third place Vicar’s In Trouble, Flat Gone, Gold Hawk, Commanding Curve, and Rise Up, which makes for a very interesting race! Intense Holiday and Albano (shown above in the Risen Star Stakes) will battle it out again in the Louisiana Derby on Saturday, March 29, 2014 at Fair Grounds Race Course. Experts agree there is no doubt that three-year-old Intense Holiday, the son of Harlan’s Holiday who won the Florida Derby and Bluegrass Stakes in 2002 for StarLight Racing, is steadily improving as he gains momentum, and fans, down the Road to the Kentucky Derby. Some say Intense Holiday (Harlan’s Holiday-Intensify by Unbridled’s Song) is extremely resilient and should mature very nicely before the first weekend of May. 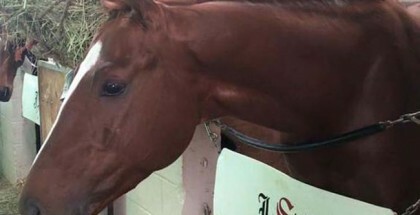 Despite spending most of his winter days training at Palm Meadows Training Center in Boynton Beach, Florida, trainer Todd Pletcher decided the Louisiana Derby, which takes place on the same day as the Florida Derby at Gulfstream Park, would be the best route for Intense Holiday. 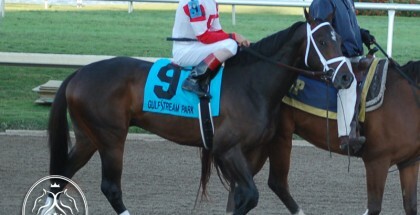 Intense Holiday will team up jockey Mike Smith and break from post position #1 in the 2014 Louisiana Derby. Most recently, Intense Holiday and jockey Mike Smith won the GII Risen Star Stakes at Fair Grounds on February 22, 2014, which earned the StarLight Racing colt 50 points on the Kentucky Derby Trail. Prior to the Risen Star Stakes victory, Intense Holiday earned 2 points for his 3rd place finish in the Holy Bull Stakes and 1 point for a 4th place finish Remsen Stakes. 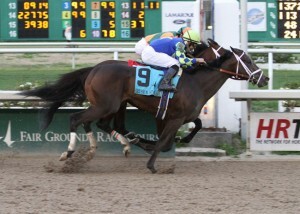 The GIII 1 1/8 mile $1 million Louisiana Derby is the 11th race of the day with a post time of 6:10 PM CDT. The cast of 50 to 1 will be at Fair Grounds Race Course for the 2014 Louisiana Derby signing autographed posters for the first 200 fans. Lady and The Track would like to wish StarLight Racing, trainer Todd Pletcher, jockey Mike Smith, and the incredible Intense Holiday the best of luck in the 2014 Louisiana Stakes. Good Luck! Safe Run!